Should you immediately begin paying optometry student loans or start investing after graduating from school? The answer can vary. We examine 3 different scenarios and strategies of paying off optometry student loans. You might hear a lot about refinancing optometry student loans to save on loan interest. We cover what you need to know, and how refinancing can save you big bucks! Buying a home is a massive financial decision. Can you afford a home if you're already in a massive amount of debt? We answer that question and many others. The last thing you want is a surprise from the IRS come tax season. We'll highlight what it means financially to be paid as an independent contractor versus an employee and how that impacts your tax liability. We'll also talk end of year planning to save on taxes! Optometrists face a major challenge due to the extra years of education required to achieve their degrees, the higher cost of that education, and the resulting optometry student loan debt. The options to address those debt challenges are often unclear. 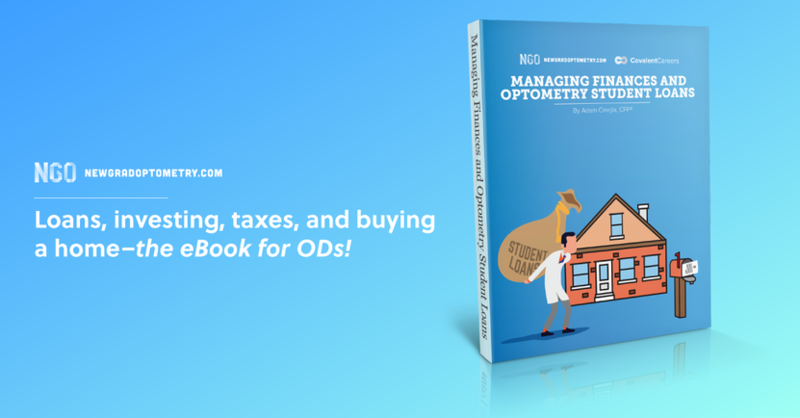 In this ebook, we hope to equip young optometrists and healthcare professionals with the additional information and insight you need to help secure financial freedom—particularly when it comes to paying off optometry student loans, taxes, and buying a home. While there is no right or wrong answer, the strategy you choose for paying off optometry student loans can make a massive impact on your financial future. While there is no right or wrong answer, in a perfectly controlled situation, one of these scenarios results in almost a $200,000 difference in the amount of money you'll have available when it is time to retire! Every approach has pros and cons — and it's amazing just how putting $500 into retirement every month rather than paying off optometry student loans can make a massive impact even over a five-year period. How Refinancing Optometry Student Loans Saved Me Over 100K! The amount of money borrowed to attend optometry school is not the amount of money that you'll need to pay back! Obviously, we are all aware that our loans are growing due to interest, but just how much does that interest add up to? Here, we highlight our author's wife, an optometrist who graduated in 2011. The following represents the cost of education to attend optometry school with simple math showing what it would cost to pay back the loan over a 30 year period (standard terms). potentially paid to her student loans over 30 years (had we taken that long to pay them off)." Refinancing these loans ended up saving the author and his wife over 100K. It can certainly be a fantastic option for many but like everything else, there are a few caveats! Can You Afford To Buy A Home With All That Optometry Student Loan Debt? The simple answer is YES! Buying a home is a massive financial decision. Make sure you understand the totality of your financial situation, including your personal balance sheet of assets and liabilities as well as your income situation. If you’ve been renting and something goes wrong, you’re used to making a simple phone call to the leasing office to have the repair completed. Now, as a homeowner, you’ll be responsible for the coordination and payment of ALL repairs on your home. There are a few things that you need to be aware of before you go on to purchase that home! A general, conservative rule to live by is to not over-leverage yourself in house payment compared to your TAKE HOME pay. Generally, we like to see this number stick somewhere between 25-32% of your after-tax/take home pay. We'll dive into all the details in the ebook! Unless you set up your own practice from day one, a component of your relationship with the practice that you started working with was whether the owner would hire you as a W-2 employee or 1099 independent contractor — a contracted optometrist. This is one of the most debated and talked-about issues within practice ownership strategies and the IRS’s definitions of what constitutes an employee and what is considered a contracted provider. We won't get into that here, but it is important to know that your classification as an independent contractor can have massive tax implications! You need to be aware of these, or else you run the risk of receiving a very unpleasant surprise come tax season! A 1099 independent contractor is paid all earnings without any taxes withheld. Therefore, it is your responsibility to understand all of the taxes that you will be required to pay come tax time and budget accordingly throughout the year. While federal and state income taxes apply to both W-2 and 1099 earnings, we start seeing some differences in taxation when it comes down to Social Security and Medicare taxes. Understanding the differences in taxation can be daunting, but if you are armed with the proper information, you can make sure you avoid independent contractor hell come tax season! What is PMI? How can you avoid it? Download the ebook and get on the road to paying off optometry student loans and understanding the nitty gritty of financial management! You're done with school, you're getting paid, and you have so many things to pay off, buy, and save for. Join us to discuss budgeting, saving, and investing for optometrists and learn how to prioritize those payments.